President Sirisena appreciates effort, says job easier under him than former Govt. Health Minister Dr. Rajitha Senaratne yesterday slashed the prices of 25 additional drugs, including cancer medication, with immediate effect under a new drug policy. The Minister made this announcement at a special felicitation ceremony where he was honoured with the title of ‘Suwapathi’ after he was appointed the Vice President of the World Health Organization (WHO). Speaking at the ceremony, he said that 10 expensive drugs would have their prices reduced with immediate effect along with 15 more essential drugs. 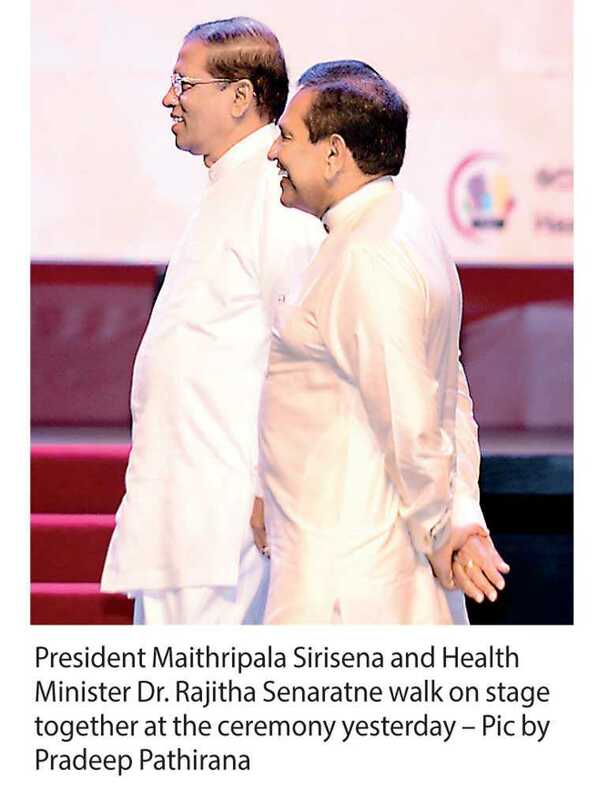 The ceremony was organised to mark the achievements of Dr. Senaratne during his tenure as Health Minister including being selected as one of four WHO Vice Presidents. Appreciating the work done by his successor, President Maithripala Sirisena noted the lack of appreciation for his own efforts during his tenure as health minister. Sirisena, speaking at the ceremony at the Nelum Pokuna Theatre, also recounted the trials he had to face in achieving his goals under the leadership of the former government. “When I brought legislation to print graphic warnings on cigarette packs covering 80% of the pack I had to explain myself to the directors of the Tobacco Company. But Dr. Senaratne did not have any hurdle to bring the same law. I spoke in that parliamentary debate also. I did it happily,” the President said while speaking of the work which had continued under Dr. Senaratne. “In 2012, I had to go to the Court and sit on Court benches for trying to formulate laws to discourage the consumption of cigarettes. When I took up the relevant Cabinet proposal, the leadership back then threw it away saying that if we discouraged the consumption of cigarettes, tourists would not come to Sri Lanka,” President Sirisena added. He also recounted his challenges in attempting to implement the Seneka Bibile Drug Policy, which had been in existence for a number of years but had never been legalised despite repeated attempts. Expressing his support to Dr. Senaratne, President Sirisena said that the current health minister would not have to face similar hurdles and he committed to continuing his assistance to improving healthcare in Sri Lanka.